There’s not many places in Birmingham that I go to review and scream hard about wanting to go back. Canal Square, located behind Brindley Place in Birmingham has certainly won me over. The Glass House is a gorgeous Punjabi Cuisine Restaurant that offers an impressive culinary dining experience and considering I don’t tend to enjoy spicy food all that much, this place completely surprised me. It seems that not many people are aware that this place exists as it’s tucked away along the canals and is fairly secluded from the buzzling life of Broad Street. The appeal of ‘The Glass House’ is that you can see the whole restaurant whilst standing outside. Visually stunning, the place has a dark interior, wooden furnishings and black chairs. A small group of food bloggers were invited to taste the new Maharajas Seven Course menu which is to launch in the coming months – and boy was it amazing! After being introduced to the owner Harvey, he kindly took my coat and offered me a flute of champagne. Once seated at our table, we were shown our tasting menu for the night and were encouraged to ‘Tweet while we eat’ which means all of these photos were taken on my phone. Our first course was the amuse bouche, crispy onion bhaji’s with a heated chilli sauce. Perfectly crisp, dunking the light batter into the dip was the perfect way to begin as they weren’t too filling. A satisfying crunch with every bite, I liked that the sauce was an accompaniment on the side in case you weren’t a fan of the heat! Spiced Potato and vegetable tikka, combined with masala chickpeas, sweet yoghurt and chaat masala. Topped with spicy coriander, the potato is soft and though not to everyone’s taste, I enjoyed the topping of blueberries which gave the dish added sweetness. It’s similar to eating a giant potato scallop but with added texture and flavour. This was one of my favourite dishes of the night and the presentation is simply stunning. Next was the tikka dish with half of the chicken marinated in tangy pickle, giving off a subtle heat. The other was marinated over night with gentle spices, garlic, fresh mint and ginger. The colours were extraordinary, although it wouldn’t have been my chosen dish of the night, it was well executed and very tasty. I love anything battered and golden, so these succulent cod pieces in cumin flavoured batter, deep fried with fresh coriander were a treat. Another fresh tasting dish, the thin batter made eating them really enjoyable. Accompanied by a chilli sauce, it was perfect to dip the morsels of cod into. By far the winning dish of the night for me and paired with a delicious Malbec, the strip of lamb fat was charred but was exceptionally tasty. The meat was tender and full of spiced flavour and had been cooked in a clay oven which kept the meat moist. I would order this again ten times over. I was getting a bit full at this point so I struggled to eat all of the samosa, filled with pork and dill but it was still a great combination. Continuing with the lamb theme, the finale was a spiced lamb curry, cooked with true maharaja elegance and infused with cinnamon, garlic and whole spices. We didn’t expect a full curry to come out and we were all thinking ‘noooo’ but I dipped my naan and rice into the delicious curry sauce. It’s honestly one of the best curry dishes I’ve experienced in a long time, so thanks for Canal Square for sharing this with us. I even asked to take some home in a box so I could eat it the following day. With just enough room left to squeeze in some dessert, the final dish of the night was an Indian sweet dessert with a duo of barfi, a small ball of condensed milk and sugar and Gajar ka halwa. This consisted of carrot in a pot containing a specific amount of water, milk and sugar. Strange textures but fascinating! I would like to thank Canal Square for an exceptional blogging meal at The Glass House. During our visit, the service was excellent but it would have been nice to see more people dining. I think this is down to people not knowing the restaurant is there, but I’m going to go as far to say that this has been one of the best blogging meals I’ve had in a long time. I’ll be taking my boyfriend there next week for a meal, and I urge you to go and try it for yourself. 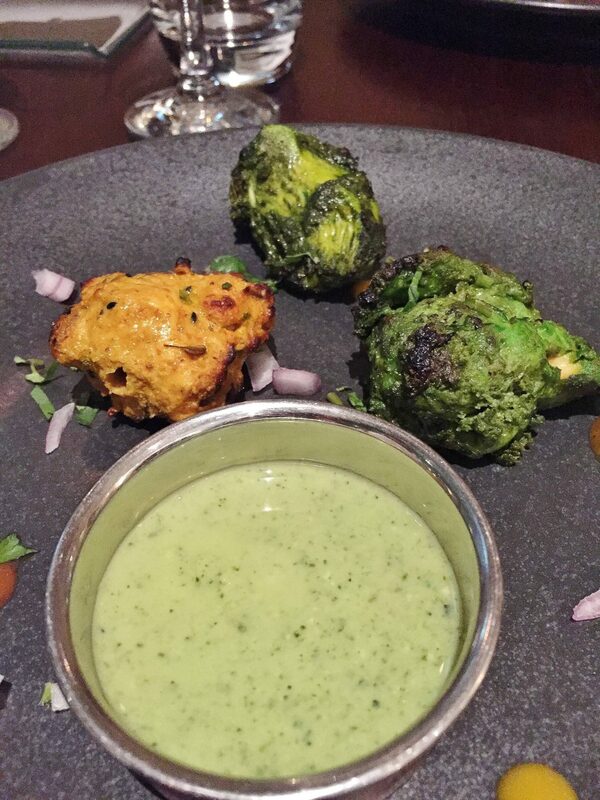 Please note: A group of us were invited to try out the Maharaja tasting menu. All of the other menus can be found on the Canal Square website.